September 19, 1959. One observed in McElroy Township near Larder Lake by Percy Richter. November 16, 2000. One observed at Hilliardton Marsh by Bruce Murphy. December 16, 2008 to January 15, 2009. One observed near Hwy. 11 in Bucke Twp. Found by Bruce and Reed Murphy. Also viewed by Serge Gendron, Michael Werner, and Robin Boyer. February 5, 2009. One observed by Jonathan Frechette in Casey Twp. April 13, 2009. 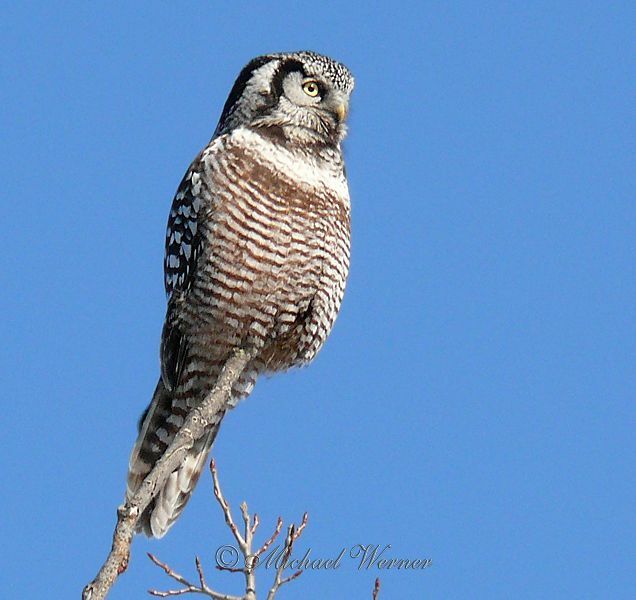 One observed and photographed by Michael Werner in Hilliard Township.